Visiting the National Museum of Natural History is a memorable experience. The digital experience should be just as magical. 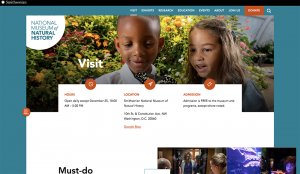 The previous site had not been updated since 2006 and did not meet the needs of the museum’s physical or virtual visitors, nor did it fully meet accessibility or mobile standards. Over the years, the number of initiatives, projects, and small department websites had sprawled to unsustainable levels and weakened the museum’s ability to support priority web projects and more strategic online goals. The project was led by the NMNH Departments of Information Technology and Communications, along with museum representatives from our numerous teams, including exhibits, education, development, collections, and research programs. Through a competitive process, the outside vendor Forum One was brought on to design the new site and support its launch. From a technical perspective, the redesign involved moving from a system based on flat HTML files managed through Adobe Dreamweaver templates to the Drupal 8 CMS. From an organizational perspective, the site update required bringing together information in a cohesive way for the varied audiences we serve, ranging from onsite visitors, educators and interns to fellows, collections professionals and visiting researchers. 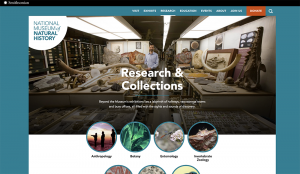 Through the new NMNH website, we worked with Forum One to develop a user experience focused primarily on the needs of visitors coming to the museum, group education, and professional visitors seeking to visit our collections or meet with science staff. Our underlying principle of the project for the website to be part of a broader “welcome mat” visitor-first philosophy, whereas the museum experience, our collections and the work we do is the main attraction – not the website. 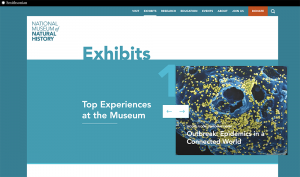 From a family planning their visit to a student conducting research to a policymaker or a systematics researcher gathering data, we built a site that engages and educates the virtual visitor and also prepares those who are coming to the museum in person. The iterative and interactive process began with a series of discovery workshop sessions in November 2017, and the redesigned, mobile-friendly site was officially launched on December 3, 2018. 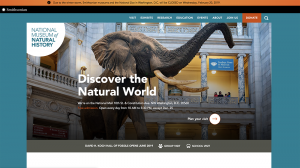 A high-impact, responsive website that elicits wonder from our visitors and emphasizes the people who work at NMNH and the work they do. 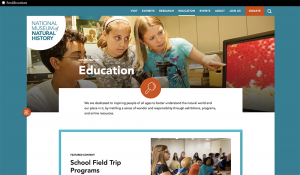 Integration of priority online visitor, collections and research content from our past websites and several third-party sites, including the Museum’s interactive science education space known as Q?rius and other program sites, collections sites, subsites, and microsites. 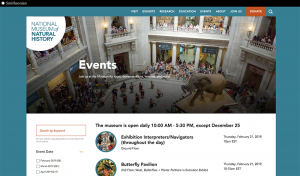 Integration with existing systems such as online-donations, calendar, ticketing and event registration, online video platform and the Smithsonian’s professional expertise database. Support in producing a modern Website Governance Policy Guide to describe processes and responsibilities for maintaining web properties moving forward. See museum alert in effect which can be used in the case of museum closures. Full search functionality for the entire site.